Ever lost a scrap of paper with some important information on it? Or forgot to check your diary and missed an appointment? Or didn't get some vital data to a co-worker 'cos they weren't at their desk? Never lose track of important dates, vital information or necessary filenames again. Quickly drag and drop URLs, file paths, selected text. Just grab information or drop it on a TurboNote+ to send to someone, and vice versa. No more risk of mistyping URLs, account numbers or filenames! Use the alarm and schedule functions, along with the calendar, to make sure you never forget an appointment or miss a deadline or birthday. Have fast, direct access to Website URLs, email addresses and local files with a simple double-click. Type in keywords and use a simple function key click to automatically run a Google search, do a foreign currency conversion or a translation. TurboNote+ instant messaging lets you instantly send notes and attached files straight to the desktops of your friends and colleagues over a local network or across the Internet. You can even chat directly via a TurboNote. 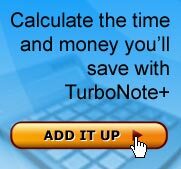 If you´ve got tasks that come up time and again, TurboNote´s recurring alarm function will help keep you organised. The alarms are quick to use, and can even be set to ignore weekends. The versatile calendar lets you see at a glance all the important dates in your life, highlighting those which have an associated alarm note. You can make it transparent and let it sit on your desktop for a quick handy reference. Double-click on any date to quickly make an alarm note. Easy-to-use menus allow you to customize individual notes or set up the default look you want. Change the colour and size, choose your preferred font, lock them in place or create special templates. Keep the contents of your private notes secure by password protecting them so others can't see them. Or send notes to others in encrypted form  very handy for shared workstations and groupwork. If you're worried about forgetting your password, we also offer a special Password Recovery service. Avoid cluttering your screen by arranging your notes the way you want. Make them roll-up automatically so only the title shows, and auto-stack them for neatness. Pick a colour or background image to suit you. Notes with ruled lines, phone message templates, checklists and other built-in styles let you quickly and easily select the kind of note that suits you. Locking a note provides additional security for its contents. Use the hide feature to clear your screen and see the notes you want to, when you want to. Use the built-in Note Manager for fast, efficient control over grouping, organisation or filtering; or for quick searches, checks of titles, text, alarm status and so on. That´s very handy if you have as many as 600 notes to work with! Use the backup files to transfer all your notes from one computer to another  handy for when you're out of the office, or on the road. Keep daily backups for up to 999 days so you´ve always got access to historical data, and you control where they are stored. For additional security, you can choose to have a monthly backup kept permanently. Check out the quick table of features here and see what the latest version does here. Even better, give it a try now  it's free for the first month, so download it now.